Can Too Much Toothpaste Damage Your Teeth? It is perfectly normal to want to keep your teeth clean and healthy. 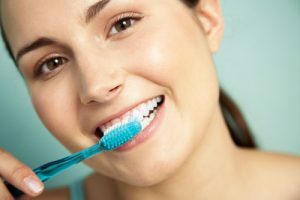 For some people, the belief that toothpaste is the catalyst to a beautiful, white smile leads them to use an extra-generous amount with each brushing. However, it’s the bristles that actually do a bulk of the cleaning, so you may be overdoing it and using too much toothpaste. Too much toothpaste can actually damage your enamel. Toothpaste contains abrasive particles, and too much can wear away at the strong tooth surface. The actual amount of toothpaste you use should be about the size of a pea. Another danger of using too much toothpaste is that you simply won’t brush all of your teeth properly. Using too much toothpaste will create too much foam, and it can be difficult to see exactly where you’ve brushed. Minimizing the foam and toothpaste residue will help you to see what you are doing. Use of the proper amount of toothpaste is especially important for children. Small children often have difficulty spitting out the excess toothpaste and foam. This may lead them to swallow extra fluoride that their bodies don’t need. This can lead to dental fluorosis, which prevents the tooth enamel from crystallizing properly. Side effects may include staining, brittleness, and surface pitting. Excess fluoride can also result in other health concerns. Swelling of the kidney tubules may result, as will dilation of the renal tubules. High concentrations of hydrogen fluoride in the body can also lead to a host of gastrointestinal issues. Are you concerned about how much toothpaste you are using? Do you need additional tips on how to better care for your teeth? Call us today to set up your next dental cleaning. We’ll help you to get a smile that you are proud to show off.